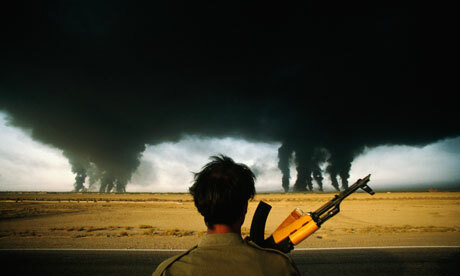 Joe Stork examines the Iran-Iraq war from the viewpoint of its main material aspects - oil and arms. The outbreak of the war forced Iraq to suspend all exports within a matter of days, and its production plummeted from 3.4 million barrels a day (mbd) to less than 500,000. Iran's production also contracted to a trickle, from 1.8 mbd to 350,000. Since both countries depend crucially on oil revenues to fuel their war economies, oil facilities have been key strategic targets - both actual and potential - from the first days of the war. In fact, actual fire has been concentrated on export rather than production facilities. Refineries and loading facilities are inherently more vulnerable targets than oilfields, and it is the revenue-generating capacity which each side wants to inderdict. Thus in the first days and weeks of the war, Iran managed to shut down Iraq's main export facilities, near the port of Fao on the Gulf. Most ofIraq's oil-based industrialization projects - steel mills, refineries, petrochemical and fertilizer plants - were situated in the war zone, in the vicinity of Basra, and these were heavily damaged. On the other side, the huge export refinery complex at Abadan, one of the largest in the world, came under heavy siege and was largely destroyed. Iran's main crude export facility at Kharg Island, with a capacity of 6 mbd, was a target for Iraqi warplanes and missiles from the beginning of the war, but the Iraqis were never able to inflict significant or lasting damage on it. Both Iraqi and Iranian oil production recovered somewhat as the war settled into various phases of stalemate. Iran could still export through Kharg, and Iraq had pipelines to the Mediterranean through Syria and Turkey. The oil aspect of this war took another turn in April 1982, when Syria closed the pipeline through its territory as part ofits overall alliance with Tehran (and in return for Iranian oil deliveries at concessionary prices). This limited Iraq's exports to just over 0.5 mbd through the Turkey pipeline (this has since been expanded to about 1 mbd) and shipment via tanker trucks overland to the Jordanian port of Aqaba. This occurred at the time when Iran had moved to the offensive on the battlefield, shifting the war to Iraqi territory, and when Iraq's foreign currency reserves had dwindled danagerously low. But neither this nor subsequent actions aimed at the adversaries' oil exports have proved decisive in bringing either side to its knees, so to speak. Wealth has been squandered and lives destroyed, but the war machines churn on, albeit on a somewhat desultory fashion. The 'tanker war' which Iraq initiated in the spring of 1984, and which it revives periodically, is only the latest instance of this lesson. For one thing, neither side has done everything it might to exploit fully this vulnerability, perhaps because it is mutual. Iraq's attacks on the tankers loading at Kharg seem to have been calibrated to keep the industrial powers' attention rather than achieve victory. For its part, Iran has made little or no effort, either directly or through its Kurdish allies, to interrupt Iraq's remaining export pipeline that goes from Kirkuk through Turkey. This probably stems from Tehran's need to remain on good terms with the generals and politicians in Ankara. Turkey is a major trading partner and supply route for Iran in its wartime environment. THE CONSEQUENCES of the war for oil prices have been surprisingly slight. A major factor in this has been the containment of the conflict to Iran and Iraq. Except for several Iranian attacks on Kuwaiti targets, and Saudi involvement in the 'tanker war' in the summer of 1984, the conflict has not spread. This remains a danger, to be sure, but so far it has not happened. In fact, Saudi Arabia expanded its production when the war broke out, to over 10 mbd, thus cushioning the immediate impact of the cutoff of Iraqi and Iranian supplies. Oil prices did rise by about $3 per barrel, to $34.84, in early 1981, but they began to decline from this peak as early as mid-1981. This price decline has continued ever since. In March 1983 OPEC formally lowered its price to $28 per barrel, and has had great difficulty holding that price ever since. If anything, the reduction of oil exports from Iran and Iraq has been a boon to the world industry - oil companies, other OPEC producers, all those interested in maintaining the price of crude - by removing millions of barrels of production from a world market brimming over with more oil than it can consume (at present prices). Indeed, the most fearsome prospect for the oil industry today is not the cutoff of exports but renewed production by Iran and Iraq and pressures from them to regain their pre-war shares of export markets. What accounts for this paradoxical situation? The war, as it turned out, coincided with a marked shift in the world oil market. This shift began before the war itself, though its consequences were not immediately apparent. The volume of world oil production peaked in December 1979 - it averaged nearly 63 mbd for that year. In the first nine months of 1980, the months just preceding the escalation of the conflict to the battlefield, world oil production dropped by 3.6 mbd. The drop in OPEC production was even steeper, nearly 1 mbd. In other words, while OPEC production fell, production by non-OPEC states increased. By 1983 OPEC production had fallen to under 16 mbd, slightly more than half of what it had been four years earlier. For nearly two years now, OPEC production has remained at this level, 15 mbd less than at the end of 1979. During this same period, by contrast, world oil production fell by only 10 mbd. Thus there has been a 5 mbd increase in non-OPEC production since 1979. Another expression of OPEC's changed relationship to the world oil market is that in 1979 the world oil industry was operating at approximately 91 per cent of production capacity. In 1984 it was operating at only 75 per cent of capacity. Most of this spare capacity is in the Gulf. This turnaround in the world oil market is related to a number of different factors. One is the reduction in energy consumption demand induced by the global recession affecting both industrialized and industrializing countries. Another factor is the impact of energy conservation measures and shifts to alternative fuels. A third is the stockpiling of oil supplies by both consuming and producing countries. For instance, the US strategic petroleum reserve now contains some 400 million barrels of crude, and in recent months Saudi Arabia has had between 25 and 60 million barrels of crude afloat on tankers outside the Gulf. A fourth factor is the expansion of non-OPEC production. Of the 5 mbd increase since 1979, approximately half is accounted for by Mexico and by British and Norwegian production in the North Sea. New production in the US has enabled America to reverse the trend of several decades of steadily increasing imports. Last but not least, the huge industrial development and import programme of the oil producing countries, OPEC and non-OPEC alike, have practically eliminated surplus revenues and turned even states like Saudi Arabia into 'high-absorption' producers. The absolute need of societies like Saudi Arabia and Kuwait for imports and revenues may not be nearly as great as that of Nigeria and Algeria, but social and political pressures in the former countries are strong enough to erase this distinction. Thus Saudi production dropped from more than 10 mbd in early 1981 to less than 5 mbd by early 1983. Once the Saudis determined that they could no longer absorb further production cutbacks, the official price cutting began. THIS LAST feature - the pressure on the oil producers to produce and export even at the cost of driving prices down still further - brings us back to a consideration of the place of oil in this strange war. For the war itself has proved to be an insatiable absorbant of oil revenues, not just of the combatant states but of Iraq's official Arab patrons as well. If the war in the Gulf has not had the dire price consequences on the world oil market that were once feared, it is still a war whose uniqueness is intimately related to its proximity to and access to the fabulous oil reserves of the Gulf region. There are several important respects in which this war revolves around oil. First and perhaps most obviously, oil production and revenues have fuelled the war. Iraq began its invasion only after it had escalated oil production and amassed foreign currency reserves that would sustain it for two years of war. (And indeed, it was only as the war neared the end of the second year with no resolution in sight that Iraq's financial problems became acute.) The war simply could not have continued at this level of carnage and destruction for this long without the oil revenues of the protagonists and Iraq's Arab neighbours. A war of this duration and relative intensity between, say, Ethiopia and Somalia is uminaginable. If estimates of military costs of $1 billion per month for each combatant state are remotely accurate, this means that the war has cost nearly $100 billion in the military realm alone, not counting damage to economic infrastructure, or the indirect costs to these societies in their allocation oflabour and capital. Consider, for instance, Iraq's lavish compensation to the families of its many 'martyrs'. Of course, this has a political purpose, to forestall discontent and opposition stemming from this disaster. This is also an 'oil war' in a derivative sense. The war was unlocked, one might say, by the Iranian revolution. This revolution was very much a product of the social, economic and political dynamics fostered by Iran's 'oil mono culture'. Furthermore, the intense hostilities between Tehran and Baghdad in the post World War II period - and to some extent even before-were very much related to the manipulations of foreign powers, especially the United States and Britain. Washington and Whitehall and the 'Seven Sisters' used Iraq to combat Iranian nationalism (under Mossadeq), and the Shah to combat Iraqi nationalism (under Qassem, 'Aref and the Ba'th). Finally, oil has sustained this war politically, too, in terms of the regional and international alignment behind Iraq. At one level, French and American support for Baghdad is motivated by the prospect of future Iraqi markets for exports and contracts. More generally, though, fear of Iranian political hegemony in the Gulf, which would enable Iran to determine future terms of access to oil from the Arab states there as well, accounts for this co-operative support for Iraq aimed at preventing an Iranian victory on the ground. At this point, the strategy seems to have succeeded in moving the war from a stage of attrition (at Iraq's expense) to one of stalemate (or mutual attrition). The major purpose of this Franco-American strategy seems to be to insure the Iraqi economy against collapse by encouraging renewed financial support from the other Arab oil states in the short run, and by increasing Iraqi export capabilities via new pipelines across Saudi Arabia and Jordan for the longer term. The new pipelines serve the larger purpose ofincreasing export facilities forthe Gulfregion as a whole, and replacing ARAMCO's aging TAPline system. ANOTHER IMPORTANT concern of the US and other industrialized countries is the continued recycling of capital in the form of purchases and payments for goods and services imported by the oil producing states. This process has accelerated in the military sector as a result of the war, primarily through Iraqi purchases. On the other hand, development expenditures in both countries have been cut back considerably in order to meet the extraordinary costs of financing the war. This war has been one of the most protracted and most devastating conflicts since the end of World War II, in terms of casualties and economic damage. But it has not been a highly intense conflict in terms of arms consumption, particularly of technologically advanced weapons systems. For the most part, the war has been fought on the ground, with infantry, tanks and artillery, and has not involved significant air or naval battles. To some extent this has been dictated by the nature of the objectives of each side. It is no doubt also related to the fact that during the first two years of the war, both sides were cut off from their respective major suppliers - Iraq from the Soviet Union, Iran from the United States. Purchases had to be made from or through third parties. Iran has remained under a fairly effective arms embargo, at least in terms of acquiring major new weapons systems. Iraq, for its part, has been able to acquire advanced weapons systems from France, Italy and (again) the Soviet Union, but has been extremely cautious in deploying or engaging them for fear oflosses and casualties. This reflects Iraq's poor attack capabilities. Iran had acquired an immense stock of highly sophisticated weaponry under the Shah, but the impact of the revolutionary upheaval combined with wartime deterioration has reduced the utility of this stock, especially air power. The present balance of forces represents Iraq's access to resupply since early 1983, and Iran's continued attrition. Iran began the war with more than 350 combat aircraft but now has no more than 65. As of mid-1984 Iraq had more than 330 combat aircraft. In main battle tanks, Iran has 8-900 to Iraq's 2-3,000, despite the fact that Iraq lost some 2,500 tanks midway through the war. The ratio of armoured personnel carriers is similar: 7-800 for Iran, to 3,000 for Iraq. Both superpowers have supplied both belligerents in the course of this war, but both have done so largely through third parties. This has enabled them to maintain relatively low profiles in order to keep postwar military supply and political alliance options open in the region. France has been the major Western supplier to Iraq, providing an estimated $5 billion worth of arms since the war began. Iraq has accounted for 40 per cent of French arms exports over this period. Paris claims, and Washington denies, that the US tacitly endorses the French-Iraqi military supply relationship. Much less ambiguous has been Washington's encouragement of its major allies in the Arab world - Egypt, Jordan and Saudi Arabia - to transfer arms, finance military purchases and to provide critical maintenance and training personnel to Iraq. When the war ends or winds down, both belligerents will doubtless engage in massive rearmament projects, especially expensive, hightechnology weapons systems. Both the war itself and this prospective rearmament cycle have provided the motor force for major military acquisitions throughout the region, especially among the Gulf Co-operation Council countries. THIS WAR may now be entering a phase of 'no war-no peace', reflecting the stalemate on the battlefield. Or it may erupt again with great intensity, and even lead to some truce or capitulation. Whatever the immediate results, however, the war will not end in practice. What we are seeing here is another hundred years' war. The blood, treasure and political capital invested by both sides make any pacific resolution almost inconceivable. How long will it be before one side or the other, under new 'revolutionary' leadership, makes a bid to 'recover the national honour' or 'patrimony' lost in this current round? This is a conflict rooted in nationalism, one which even the superpowers can merely exploit, not control. It has already suffered the political contours of the region, as Iraq has lost its bid for regional hegemony and instead become beholden to the conservative wealthy Arab states of the peninsula. In the years immediately ahead, oil is likely to figure prominently once again in the political contests in the region, as both Iran and Iraq attempt to finance their reconstruction and rearmament by increasing their oil sales and revenues, more than likely at the expense of each other and their OPEC neighbours. 2. See the study by Quandt and McNaugher, excerpted in MERIP Reports 125/126, JulySeptember 1984. 3. Anthony Cordesman, 'The Gulf Crisis and Strategic Interests: A Military Analysis', American-Arab Affairs 9, Summer 1984. 4. The SIPRI data is presented in MERIP Reports 125/126, July-September 1984.